Come on down to the Aquatic Reserve in West Lakes to join us for a wonderful morning of Dragonboating, water activities and a fun day out for the whole family. 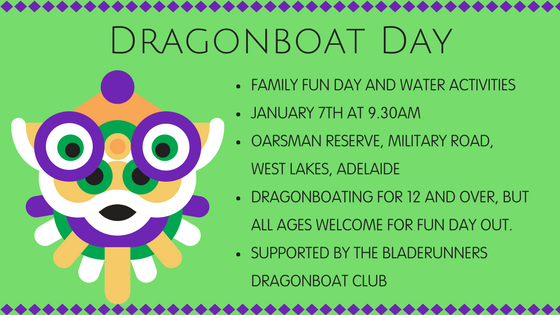 The Bladerunners Dragonboat Club have extended a special invitation for the AAAF community to join them for a day of exploring this fantastic sport. Dragonboating is all about working in a team and supporting each other, and will be a fantastic outing in support of our #HealthyAlopecia campaign, as well as a great way to meet new friends. Due to water safety concerns, children must be 12 years of age or older to try their hand with the boats, but all are welcome to join us for a beautiful day on the river. Fantastic fun for the family this school holidays. You can find out more about the day here. Be sure to bring a water bottle, sun protection, and be aware that clothes and shoes may get wet.